Gorilla Productions is proud to present the Off-Broadway parody of the seminal '80s film, Fatal Attraction: A Greek Tragedy. Co-written by Alana McNair and Kate Wilkinson and directed by Timothy Haskell, this new comedy lovingly and liberally parodies the well-known thriller from 1987. Previews for this limited engagement begin Friday, July 1 at 10;30 PM at The East 13th Street Theatre, located at 136 East 13th Street between 3rd and 4th Avenues, just southeast of Union Square. Press performances begin Tuesday, July 5. For press inquiries, please call 212.307.1118. 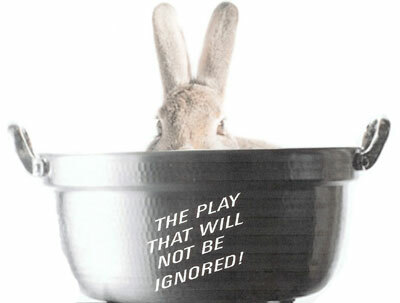 The play officially opens Sunday, July 10 at 6 PM and closes Saturday, August 27. The schedule is Tuesday - Thursday at 8 PM, Friday & Saturday at 8 PM and 10:30 PM; Sundays at 6 PM. Tickets for Tuesday - Thursday and Sunday shows are $49.50. Friday & Saturday shows are $49.50 at 8 PM; $45 at 10:30 PM. To purchase tickets by phone, please call Ticket Central at 212.279.4200. A select amount of $20 Rush Tickets will also be available at the door for all shows, and will be sold on a first-come first-serve basis. The plot of Fatal Attraction: A Greek Tragedy loosely follows the Academy Award winning film. When a big-time corporate lawyer has a one-night stand with a no-nonsense business woman while his wife is away, all hell breaks loose. Skewering the film's blatant fear of the successful business woman in contrast to its celebration of traditional family values, the play adopts a chorus that comments on the action by using text from the Greek tragedy oeuvre. Running at a breakneck pace of 70 minutes, this parody of the '80s classic tells its own story with a kinetic beat, a boiled bunny dance sequence, and numerous of kungfu action scenes. Corey Feldman, starring in the role of Michael Douglas, is an actor synonymous with the '80s. He has starred in over 50 films, including Steven Spielberg's The Goonies and Gremlins, Rob Reiner's critically acclaimed Stand By Me; The Lost Boys, License to Drive, The 'Burbs, Bordello of Blood, Dream a Little Dream, Busted, Friday 13th Part IV and V, and The Teenage Mutant Ninja Turtles. Director Timothy Haskell helmed the Paris Hilton spoof, I Love Paris, as well as the comedy Corporate Rock at the Blue Heron Arts Center. At 10 months (and counting), I Love Paris is now the longest-running show in the theatre's history. He might be best known for creating and directing last season's cult hit Road House: The Stage Play at the Barrow Street Theatre. Alana McNair, who plays Glenn Close in addition to having co-written the play, is a graduate of NYU's Tisch School. She has studied with performance artist Karen Finley, and her full-length work, Just Piddlin': a dirt road operetta, was produced last year. Kate Wilkinson, co-writer of the play, plays the comely housewife, Anne Archer. Wilkinson is also a graduate of NYU's Tisch School, and has written and directed several short films, including Flufferlover, Fries & Thighs: The After Hours World of the Market Diner, and Waterloo Pier.